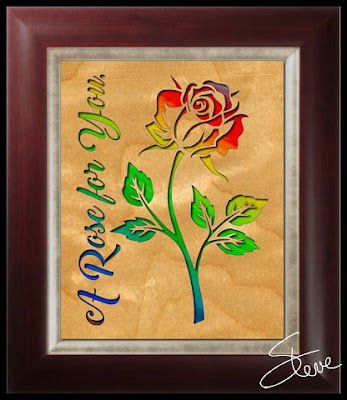 A Rose for You Scroll Saw Pattern. This 8" X 10" pattern could be a nice Valentines Day gift. I included the color image for you to print for the backer. Of course you can use any backer you like. I usually make this type of pattern 8" X 10" because it's easier to find a frame. If you use 1/8" thick Baltic Birch plywood you will find it fit's in most frames better. A lot of frames are not deep enough for 1/4" thick boards. Make sure you check the frame before you buy one. 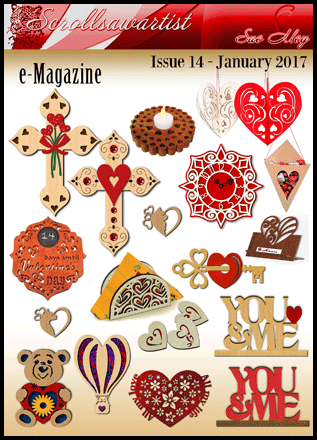 Sue Mey has published the January edition of her eMagazine. Looks like she has you all set for your Valentines Day patterns. Check it out. Enter the Bear Woods $75 gift certificate giveaway. This month you are only allowed 1 entry then you are locked out. BUILT-TO-LAST: Durable & water resistant, 16 oz waxed canvas bib apron. Double stitched pockets. Reinforced with gun-metal rivets & grommets. DESIGNED FOR COMFORT & STYLE: Prevent neck pain with cross-back straps. Professional flat-black styling for men and women. 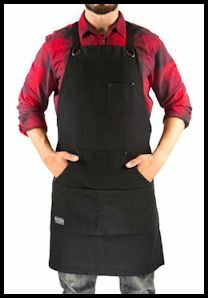 VERSATILE SIZING: Large apron measures 27 inches wide x 34 inches tall for unisex sizing. Long straps for up to men's XXL sizes. MULTI POCKETS: Large, easy access tool pockets in front. Cell phone/pencil pocket on front chest. "Kangaroo" style hand pocket. 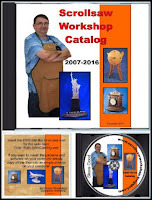 BROAD USE: Work apron, tool apron, utility apron, shop apron for carpenters, woodworkers, mechanics, machinists, gardeners, artists, chefs, bakers, tattoo artists, technicians, barbers, bartenders, leatherwork, metalwork, crafts, blacksmiths, baristas, butchers, brewers, makers, painters, tinkerers, hobbyists, art teachers, men's apron, and more. Excellent gift for men, women, mothers and fathers. For professional and commercial use. 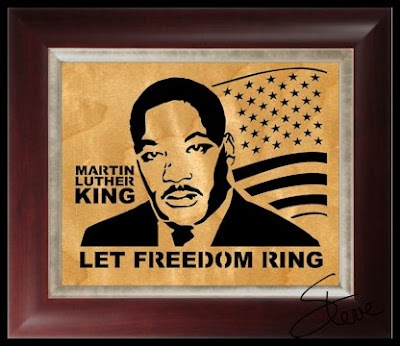 Martin Luther King Day Scroll Saw Pattern. Many new scrollers ask me about spiral scroll saw blades. When I try to answer their question I always mention portrait style patterns as their best use. The pattern in this post is a portrait style pattern. Not because it's a portrait though. A portrait style pattern is just a pattern of an object or person that is designed using the contrast of dark and light in the image to make the pattern. The interior cuts of this type of pattern are usually organic/irregular shapes. Spiral blades do not track a straight line very well. Spiral blades are designed to cut in any direction. Because of this trait they will go off a pattern line with the least amount of pressure in the wrong direction. With practice you can get better at following a line but never as accurate as a straight blade. When you use a spiral blade on a pattern like the one in this post you have the advantage of not having to turn the wood. You just move the wood in the direction you want to cut. Because the are mostly irregular shapes not one will notice if you are off the pattern line a little. 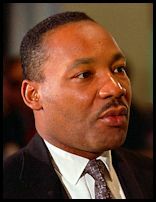 In this pattern I would use a spiral blade to cut the image of MLK then switch to a straight blade for the flag and lettering. In the YouTube video below Dave cuts an Elvis portrait style pattern using a spiral blade. It's a good example of the proper use of the spiral. Thanks to Dave Woodworks for sharing the video. Enter to win the Bear Woods $75 gift certificate giveaway. Entries Deadline for entry. 1/31/17 11:59PM. One entry per person. 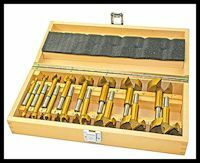 Forstner bits bore smooth, flat bottomed holes with clean edges.